Movavi Screen Capture is a very light weight voice and screen recorder that gets to capture anything that is on your screen. As a Mac user, you can be able to record Skype calls without any complications as well as being able to record games and streaming videos. The quality of video that is normally recorded by this software is of top-notch quality. It is a powerful software that captures both audio and videos within no time. The capture settings are usually very flexible since you can choose to record even from both sides. Additionally, Movavi Screen Capture for Mac can be able to capture and grab online streaming videos as well as taking desktop snapshots. 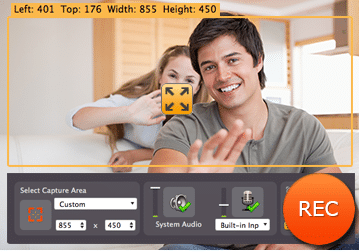 There is an inbuilt video polisher that can be used to edit your audios and videos entirely. Use the onscreen interface or the hotkeys to control your Skype recording sessions. Audio files can be compressed without messing-up the picture quality. Presence of a control panel that has a pause, stop, back and rewind buttons. They help in producing quality end-product. Recording timers that enable you to know the exact time that you recorded. You can be able to view your recorded files when you are recording. There is an added program/application that is labelled as “screen capture” that will enable you to immediately take your screen shots so that you do not have to wait for the whole program to launch and open. The end user is also able to set and reset the volume before the recording. There are those end users who might find it difficult to use this application for capture. In such a situation the end users can purchase the Movavi Screen Capture Studio so that they can be able to edit and trim their audios as they might wish to. This application is available for Mac users only. There many reasons to why one needs a voice capture software. Reasons ranges from recording Skype calls, creating a software bug report, video tutorials, and demos. The below guide will help you understand how you can use Movavi tool and achieve great voice and screen activities. After you have installed your Movavi Screen Capture, launch it and confirm if the microphone and speaker icons have the green check marks. This assures you that the application will record both from your audio input and output devices as well as from the other party. 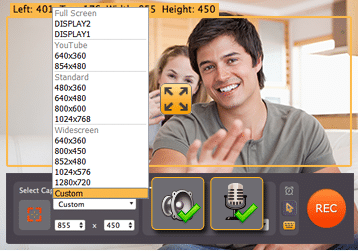 Select your device for recording at the input device menu. 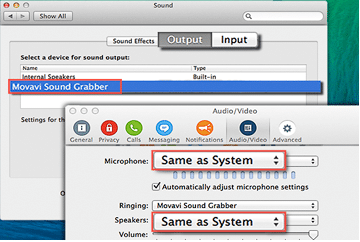 To record Skype conversation on Mac, ensure the system sound devices matches with that of your Skype. Its simple, go to Mac menu and click System Preferences-Sound. Settings are set on the corresponding tabs where both the output sound devices and current system input match each other. Go to your Skype and press # to retrieve settings on your Mac. On the settings window, find the Audio/Video tab and set the same options on your Speakers and Microphone menus. Alternatively, match the system options on both devices. You can now place your Skype call and adjust the capture area on your Mac. On the screen capture interface, press REC and you are good to go. Click #-1 to pause and #-2 to stop. Alternatively, the call recorder panel has all the buttons to manage your Skype recording sessions. After you have successfully recorded your call, you can preview it on the media player window. Trim your recording by positioning your trim makers. On your Save list, pick your call recording. To get your preferred audio format, go to Video and audio section. Select the best saving options from MP4 or MP3. Go to Devices tab and choose your best saving present. Click Save and you now have your final call file ready for listening or watching. Individuals and business men can be able to use this software application to capture and edit their audio and video Skype conversations. This is a very affordable application that has numerous editing tools and additional features. You can be able to learn many of the editing tools that this application possesses for maximum results and for maximum use of the tool.